Itchy skin is a common childhood complaint. Unfortunately, itching the skin usually only makes a rash worse and perpetuates the discomfort. Parents often wonder why their child is itching her skin and what they can do to help relieve the itching. Common causes of itchy skin in children include eczema, contact dermatitis, insect bites, scabies and poison ivy. Eczema is a common skin condition in children characterized by dry, sensitive skin that becomes red and itchy. 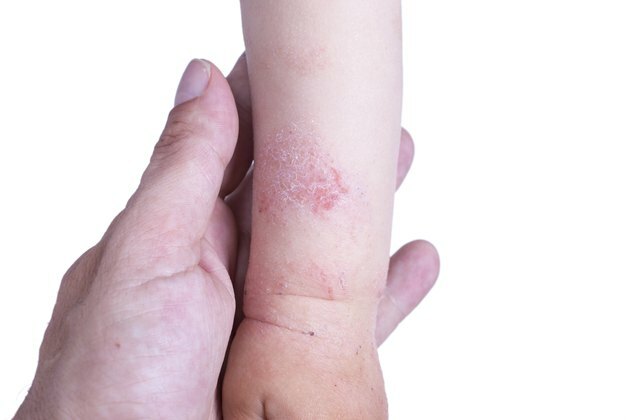 The rash often becomes crusted and raw, especially if the child is itching it. The cause of eczema is unknown, but children with asthma and allergies are at higher risk. Common locations for eczema include the forehead, cheeks, scalp, ears, and creases in the skin, such as at the elbows, knees, and wrists. Contact dermatitis is a general term used when skin has come into contact with an irritant or allergen that has caused a rash. The rash is usually red, itchy, and burning. Sometimes, there is also blistering of the skin and swelling. The rash occurs at the spot on the skin that came into contact with the irritant or allergen. Common irritants include soaps, detergents, saliva, latex, perfumes, and some metals found in jewelry. Insect bites are notorious for causing itchy skin. Mosquitoes are the most common offenders. Fleas and bed bugs can also cause itchy skin, whereas horseflies, gnats and fire ants can cause painful bites. Insect bites usually cause a small red bump or pimple on the skin. Sometimes in younger children, a small blister forms at the site of the bite. The red bumps of a mosquito bite are the body's allergic reaction to the bite. Poison ivy is a common plant in the United States that grows in groups on the ground or as a vine winding up a tree. The stems of both have a characteristic three leaves. Poison ivy contains urushiol, an oil that binds to the skin when skin comes into contact with it. Urushiol is the component of poison ivy that causes an allergic reaction. The rash typically appears one to two days after contact with poison ivy. The affected area becomes red and swollen and then blisters form. The blisters are extremely itchy, but unfortunately, scratching them will spread the rash to other parts of the body. Scabies is a parasitic infection caused by a tiny mite that burrows in the skin, where it lays eggs and releases toxins. Intense itching is caused by the allergic reaction that develops to the toxins released by the mite. In the early stage of the infection, the main symptoms are itching and the appearance of little red bumps on the skin. As the infection progresses, the skin may become crusty or scaly.